The plaque commemorates the devastating bushfire which occurred on the February 1977. 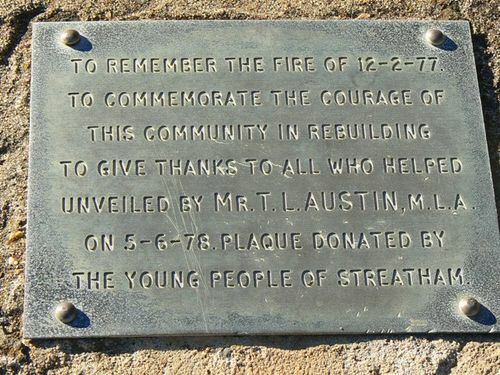 On 12 February 1977, Streatham was partially destroyed by a bushfire which was one of many that spread rapidly across the plains of Western Victoria that day. The fire left five men dead and a further seven people suffering heart attacks while defending their properties and the town. The Church, post office, community hall, shops and eighty-one homes were all destroyed in the blaze. To remember the fire of 12-2-77. To give thanks to all who helped. Unveiled by Mr. T. L. Austin, M.L.A. On 5-6-78.